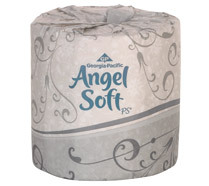 20 TRIPLE Rolls of Angel Soft Toilet Paper only $5.00! $0.09 per Roll = SUPER HOT! WOW! Hurry over to OfficeMax to score 20 triple rolls of Angel Soft toilet paper for only $5.00! Each roll has 450 2-ply sheets and if these were regular rolls that's just $0.09 per roll! If you order 4 of them you'll score free shipping! Thanks, Couponing to Disney and Couponing to be Debt Free!